Toyohara Kunichika (1835-1900) The Actor Onoe Kikugoro V (Onoe Baiko) as Okazaki neko (Cat Demon of Okazaki), from the series One Hundred Roles of Baiko, 1893. Oban. Undoubtedly the most dramatic design of the entire series, this portrait is of the cat demon of Okazaki. Okazaki is a post station on the Tokaido highway and legend had it that a neko - cat demon - inhabited a temple on the outskirts of the town. It was her habit to lure young women to their deaths disguised as an old woman. There are several related myths and an equally large number of kabuki plays on the theme. 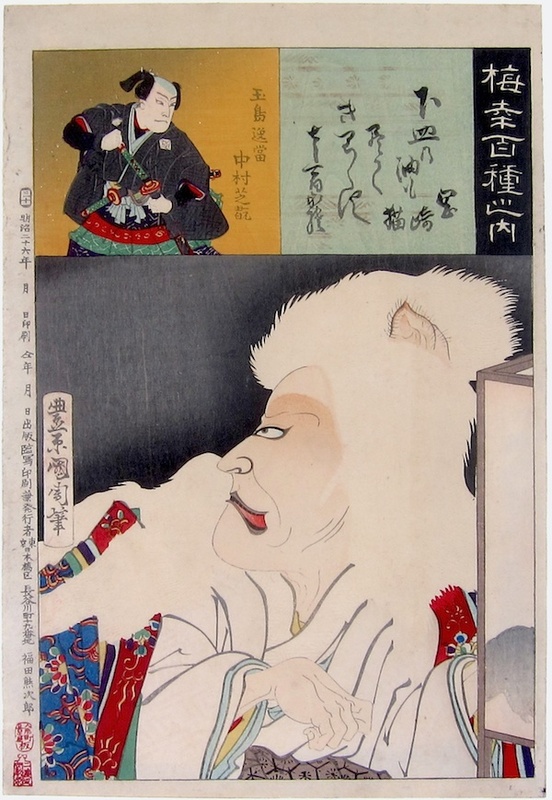 In this design Kunichika pictures the grimacing cat witch; her true nature revealed by the shadow of a paw behind the lantern, and of course by the unmistakable ears. The supporting role in the upper right is the actor Nakamura Shikan.The print is deeply embossed throughout with mica added to the blue parts of the robe. A deluxe edition print in fine condition. Strong impression, unfaded colours, fine condition throughout except for a light kink on the right hand side of the print. The story was made into a well regarded film, Ghost Cat of the Okazaki Upheaval by Bin Kato in 1954. Signed Toyohara Kunichika hitsu. Published by Fukuda Kamajiro.